Everybody does corn beef and cabbage for St.Patrick's Day. Boring. I really wasn't in the mood for it this year. Plus, I didn't really want to blow a wad of cash on a fatty beef-chunk. Saturday at the radio show with Jan D'Atri we had some beautiful Irish ladies in for the show! 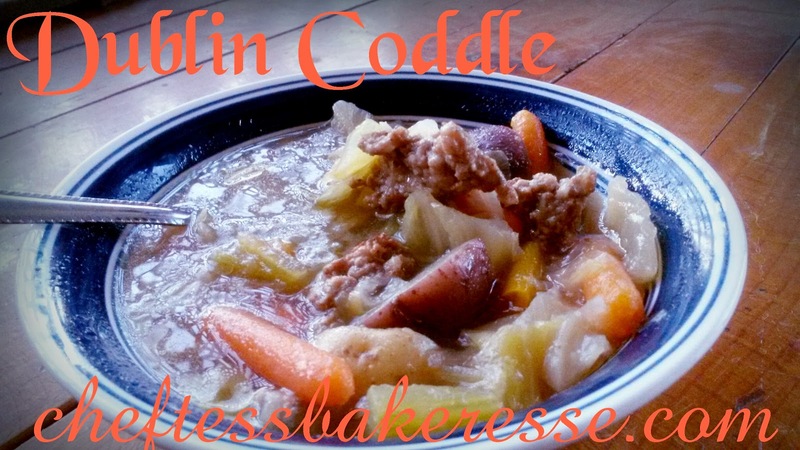 Neeve from Dublin brought us a traditional Dublin Coddle...I fell instantly in love (with her and her dish)! I love a good Irish accent. It's just so...swoon...cool. You will not believe how easy this recipe of hers is to make! Neeve informed us that this dish had been around for centuries and was different for every family. It originated in the pubs at the docks of Dublin. Classy stuff. There were some basic ingredients that most natives would use: Potatoes, pork sausage, rashers (aka "back bacon" or in American terms "Canadian Bacon"), onions, sometimes cabbage, sometimes carrots, sometimes celery, and a hearty broth if you have it. If you don't have broth, you can just use water, and it is called a "blind coddle". You get the picture. Really it is a one-pot slow cooker dish that you throw together using whatever you have around as long as it fits those loose guidelines. I'm in love already. So I decided to make some for my family for dinner Sunday night. It got rave reviews. I didn't have to really do much to look like an Irish princess. Mission accomplished. Directions: Combine all ingredients in a large gallon slow-cooker. Heat on high for 2-3 hours until vegetables are tender. Serve hot with fresh Irish Soda Bread or 9 Grain Sour Cream Irish Soda Bread . There you go! Happy St. Patrick's Day! My grandparents made this every month when funds became short. They called it Mulligan Stew, also Irish, from their parents who came from Ireland. The ingredients changed depending on what they had on hand, but the basics remained the same.